Yes, for whatever reason it's hard to get Gutenberg to show up on my Kindle here. So I gave up. I tend to buy for my Kindle when books go on sale. But now and then I splurge. :) Mostly though, I prefer the actual 'flesh and blood' book. Ha. 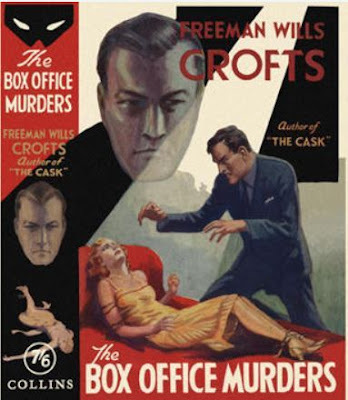 But Freeman Wills Crofts' books - except for a few - are pretty difficult to find. This is an especially good one also I'd look for THE HOG'S BACK MYSTERY which is available for Kindle and in a British Library Crime Classics edition, if you haven't read it yet. I really have too many books to read, so not looking for more to add to my piles. But the premise of this one does sound very good. It is a shame that all the copies I see are very expensive, and I am not ready to try it as an e-book. But maybe someday it will turn up a the book sale. I'm not all that keen on e-books either, Tracy. But in my view they're better than nothing. :) Some books are just impossible to find otherwise. I hope this one does turn up for you. It's terrific. This book came up this morning on my Kindle deals for $1.93 (odd price) and I had to download it after reading your review. This author is new to me, and I'm so glad for the introduction. I think he'll become a new favourite. Thanks!